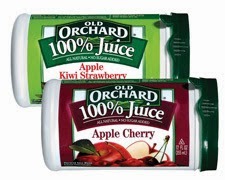 Enter to Win Juice for a year from Old Orchard! Frozen Juice Sweepstakes - Enter to Win! Five lucky winners will receive 52 VIP coupons, each redeemable for a FREE can of Old Orchard frozen juice concentrate, up to a $1.99 value. To enter, simply complete the entry form on our website or Facebook page. Entries must be received by 11:59pm ET on April 30, 2014. Limit one entry per person. Click HERE to be directed to their Facebook Page!